Nephropathy is damage or disease of the kidney. IgA is a type of antibody that helps the body fight against infection. IgA nephropathy is a kidney disease in which this naturally occurring antibody is deposited in the kidneys. This subsequently leads to inflammation of the kidneys, which gives rise to the leaking of blood and protein. This inflammation may subsequently lead to scarring in the kidneys and loss of kidney function into the urine, known respectively as haematuria+proteinuria. IgA nephropathy is also called Berger’s Disease. It is a very common cause of kidney disease around the world. The disease can affect people of all ages but it is most commonly diagnosed in the second and third decades of life. What are the causes of IgA nephropathy? The cause(s) of IgA nephropathy are not completely understood. The IgA antibodies produced in affected individuals appear to be abnormal and this causes them to stick to other antibodies in the blood as well as to the filters of the kidney leading to inflammation and damage. 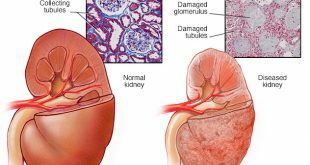 What are the symptoms and signs of IgA nephropathy? There may be no symptoms for many years. However, almost all affected individuals will have blood in their urine (hematuria), which may not be visible to the naked eye. In many patients with IgA nephropathy, the blood is first detected on urine tests (urinalysis) performed by the doctor as part of the pre-employment medical examination or as part of an evaluation of another condition such as high blood pressure such as a sore throat or a cough. In some, the blood is visible and gives a brown or red appearance of the urine. This is more common in children and young adults and is often associated with recent upper respiratory tract infection. There are no specific changes seen during a physical examination. Sometimes, the blood pressure may be high or there may be swelling of the body. A kidney biopsy is required to establish the diagnosis of IgA nephropathy and to distinguish it from other diseases that may also cause blood and protein losses in the urine and abnormal kidney function. Urine tests – This is to assess the severity of protein leak in the urine. Blood tests – The kidneys remove waste materials such as creatinine and urea from the blood. a high blood level of urea and creatinine indicate that kidney function is declining. Your doctor should estimate the level of your kidney function based on the blood level of creatinine. Imaging tests – such as ultrasound of the kidneys and the urinary tract. What is the treatment of IgA nephropathy? The goal of treatment is to relieve symptoms and delay the progression of chronic kidney disease. Controlling blood pressure is the most important way to delay the progression of kidney disease. A specific group of medicines is usually used to help control blood pressure. These medicines are called Angiotensin-Converting Enzyme inhibitors (ACEi) and Angiotensin Receptor Blockers (ARBs). This group of medicines is helpful in reducing the amount of protein leak in the urine apart from reducing blood pressure. Some people will need to take medicines to lower their cholesterol. In most cases, a restricted protein diet is usually recommended. Many patients will show improvement in kidney function and have a decrease in urine protein losses with these therapies and will not require additional medications. However, in those who do not respond to this conservative treatment and continue to show deterioration of kidney function, more specific treatments may be used to help suppress the immune system from making abnormal IgA antibodies. There are several medications available. Steroids (such as prednisolone) are often tried for several months, particularly in people who have large amounts of protein leakage from the kidney. Other immunosuppressive drugs may be used in addition to or instead of the steroids. These include drugs such as cyclophosphamide. Cyclosporin A or mycophenolate, Your kidney specialist will advise you. Fish oil has been used in the treatment of IgA nephropathy. However, the use of fish oil is controversial as it is unclear whether they have a definite benefit in the treatment of this disease. However, since they have not been shown to cause any harm to the kidney and may have potential benefit, fish oil is often used in addition to other treatments. What is the prognosis of patients with IgA nephropathy? The natural history of IgA nephropathy varies a great deal. For many, the disease remains stable or progresses very slowly. Conservative treatment may slow down the progression of kidney damage. About 20% of cases continue to lose kidney function despite treatment and may eventually need dialysis or require a kidney transplant.